Fire burn and cauldron bubble. Remember when it was a January ritual to fill in the new year on your blank checks? If you’re under 50, probably not. That we can now avoid that chore is one of life’s unsung little pleasures. But this time of year still comes, and by popular demand I must tell you what I think 2019 will bring. In a nutshell, I expect to spend this year Living Dangerously. Yes, I’m thinking of the 1982 film starring a very youthful Mel Gibson and Sigourney Weaver, based on an earlier Christopher Koch novel. It has an Asian setting and features corrupt politics, neophyte journalists, international intrigue plus a gender-bending Chinese dwarf. If you aren’t sure how all those fit together, then welcome to 2019. We are all stuck in this craziness and can only make the best of it. Nonetheless, having an outlook still helps. We’re all blasted with too much information and it’s easy to get overwhelmed. I find that having a framework helps organize my thoughts. Of course you have to be flexible and modify the framework when it no longer fits (if the facts change, etc.). But that’s better than floating aimlessly, at least to me. Another thing that can help is the Mauldin Economics Alpha Society, which is open to new members for a few more days. The Alpha Society is an exclusive “lifetime pass” that gives you all our premium research services and many other benefits for as long as we publish them. For example, Alpha Society members get to read Over My Shoulder, in which I share some of the fascinating expert knowledge that hits my inbox each week, along with a quick summary to save you time. Recently we sent material from James Montier, Art Cashin, Ed Yardeni, Louis Gave, Peter Boockvar, and more. That’s just the start. I highly suggest you go here and read about the other valuable Alpha Society benefits. I think you’ll be impressed. Now, let’s look ahead to 2019. After doing this so many times, I think one of the best approaches is to simply ask, “What could go wrong?” Other things being equal, a growing population and increasing productivity will naturally produce a growing economy. But of course other things aren’t equal, and examining the deviations is a good way to reveal what might slow or reverse growth. As I said in my 2018 forecast and again last week, I think a Federal Reserve policy mistake is our top risk. That’s less a “forecast” and more a recognition of reality, since the mistake is already happening. The Fed is raising rates and reversing its quantitative easing at the same time. They should be doing one or the other, not both. I think the global balance sheet reduction is especially harmful. I think/hope Jerome Powell will realize this in early 2019. If he doesn’t, or the rest of the FOMC disagrees with him, the year could get very rocky, very quickly. Let’s look at a few things that crossed my inbox in the last month and see if I can piece them together. I’ve been tough on the Fed but I may actually be understating the danger. The obvious points to take from Pozsar’s work are two: First, the FOMC cannot withdraw the liquidity provided to the US financial system via QE without causing the system to implode. Chairman Jerome Powell needs to publicly state that the Bernanke-Yellen inflation in asset prices will entirely reverse as the FOMC tries to reduce “excess reserves” to pre-crisis levels. Regardless of whether the FOMC raises the Fed funds target rate or not, continuing to shrink bank reserves via QT implies a significant reduction in prices for stocks and real estate. Second and more important, Powell needs to inform Congress that so long as the Treasury intends to run trillion-dollar-plus annual deficits, the Fed’s balance sheet must grow rather than shrink. To have the FOMC try to follow a narrative set in place half a century ago when fiscal deficits were minuscule is obviously impossible given the Treasury’s borrowing needs. This implies that the FOMC must embrace an explicit policy of inflation that is at odds with the legal mandate enshrined in Humphrey-Hawkins. As we’ve noted previously, the POTUS is right to criticize the Fed’s policy actions, but for the wrong reasons. The fixation of markets and the financial media on whether the FOMC raises the target rate for Fed funds or not is misplaced, part of a time-worn policy narrative that is completely antiquated. Since 2017, the only important trend in credit markets has been whether the Fed’s balance sheet is shrinking and at what rate. The move in credit spreads that started in August signaled that there is a growing problem with liquidity, yet the FOMC ignored the warning. To use another metaphor, the Fed’s QE operations left the economy addicted to a highly potent drug from which withdrawal is practically impossible but whose supply is disappearing. That is a big problem. Rising interest rates are secondary. In real terms, short-term rates are still close to zero and will stay historically low even if the Fed keeps hiking. The QE reversal is much more significant. Worse, it’s not just the Fed, as CrossBorder Capital explained in a note last month. Latest weekly data show the major Central Banks’ aggregate balance sheet shrinking at a record rate (-3.5% in constant US$ terms (3m ann.)). The pace of Fed QE reversal is unabating and the Bank of Japan has slammed on the brakes. Meanwhile, Bank of England liquidity provision continues to decline, and ECB liquidity growth has turned negative. Set against these ever-tighter DM liquidity conditions, the PBoC alone is injecting funds and at a faster pace. In current US$ terms, policy liquidity is shrinking at an even faster rate (-6.8% 3m ann.). The unrelenting Fed and US dollar strength are behind the fall. I have always been intrigued by this chart and wanted to know the actual economic data and equations behind it. So, I sent this chart and a few questions to Dr. Lacy Hunt. He kindly opened his mental textbook and share with me the explanation below. You may, as I certainly did, need to read this a few times and let it marinate in your brain. It is important because there are longstanding academic reasons for all the alarm bells going off in my inbox from other (smarter) writers than I am, and then from my own research; enough to make me nervous. This tells me why I should be. #1 means that that the base is not money but that it can be turned into money but only if little m cooperates. The determinants of little m are known, unlike those of the velocity of money. Currently, MB is declining and m is countervailing to a slight degree, but the drop in the base and the increased Federal funds rate has resulted in sharp slowdown in M2 growth from a peak of 8% per annum to slightly less than 3.9% per annum now. Slower M2 growth resulted in a sharp slowdown in nominal GDP in the third quarter of 2018. In the fourth quarter velocity of money appears to have declined and combined with slow M2 growth has resulted in an even lower rate of growth in nominal GDP. This trend should continue well into 2019. Thus, the academic economist would say that the aggregate demand curve is shifting downward, cutting the upward sloping aggregate supply curve at a lower rate of growth in nominal GDP, with a reduced pace of growth in both real GDP and inflation. #2 means that world dollar liquidity declines when the base falls unless it is countervailed by an increase in foreign official holdings of Treasury securities. Both of these components constitute tier one capital and can be leveraged. Presently, both components of world dollar are falling, draining liquidity in global markets. Tangible signs of this include: a sharp slowdown in M2 growth in Japan, the Eurocurrency zone and China, a drop in world stock and commodity prices as well as synchronized deceleration in major foreign economies. Chinese money growth recently fell to the lowest in four decades, while Japanese money growth was below the trough in two of the last three recessions. Equation #2 holds as long as the Fed is de facto the world's central bank. One other point: Excess reserves have declined far more sharply than the monetary base, serving to severely restrict the US depository institutions. Excess reserves have dropped from a peak of $2.7 trillion to $1.6 trillion. Quantitative tightening cut excess reserves about approximately $400 billion while the first eight hikes in Federal funds rate reduced excess reserves about $700 billion. We don't have sufficient data post the ninth increase in the funds rate to yet measure its impact. QT, if sustained, will reduced excess reserves $50 billion per month in 2019 or $600 billion for the year. Thus, excess reserves would drop to slightly less than $1 trillion by the end of this year. Peter Boockvar noted last week that in Q4 2017, the Fed, ECB, and BOJ combined asset purchases were $100B per month. The total dropped to zero in late 2018 and this quarter will turn negative, to a roughly $20B per month withdrawal. We are in a serious pickle. The extraordinary measures central banks took to get us out of the last crisis could make the next one even worse. They seem collectively hellbent on reducing their balance sheets. Avoiding another liquidity crisis will take some seriously active management by the FOMC and central bankers elsewhere, too. I am not confident they can do it. We have another problem, partly a result of Fed policy but also other things. The corporate bond market has, to put it in a quaint and polite term, gone berserk. Companies are more leveraged than ever yet investors still clamor to lend them more. Why? Well, one reason is the Fed’s low rates made debt capital less expensive than equity. Borrowing, whether by issuing bonds or via bank loans, has been cheaper than issuing stock for the last decade. So that’s how many businesses funded themselves. The problem, as Econ 101 says, is artificially low prices stimulate malinvestment. You might think today’s highly paid CEOs are immune to that, but many are not. We will see some interesting annual meetings next year when executives have to explain why they put their companies in debt to fund share buybacks at double or triple their current stock prices. Which, despite appearances, surely they would not do to boost their option income or bonuses. Especially if we are nearing a late cycle recession, from which that missing cash would have been a handy cushion. Yield-seeking lenders were equally foolish. They felt forced to take credit risk by the Fed-induced low Treasury rates. Many went too far. We see this in the now-common “covenant lite” loans that surrender many of the protections lenders once considered non-negotiable. Shades of 2005-07. Can’t they remember how that ended? Seriously? As a result, corporate debt as a percentage of GDP is now at a record high. 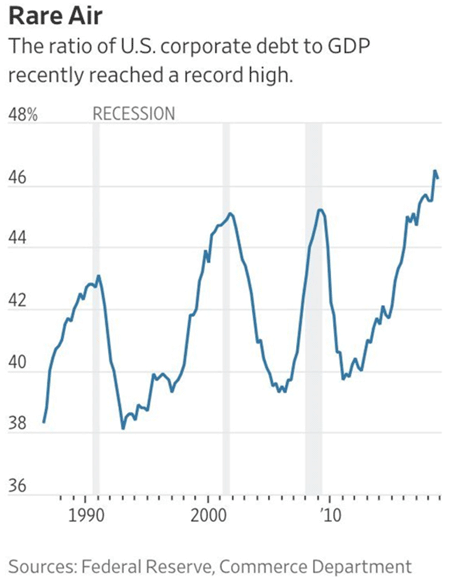 Note that recessions are proclaimed after the fact and that before previous highs we seemed to enter recession. As you can see from the recession bars, debt at these levels tends not to end happily. Worse, much of this debt is amplified as “leveraged loans” which I suspect will also not end happily. How is this a problem? Corporate bond prices are beginning to reflect higher default risk as rates rise and the economy weakens. As those prices fall, some investors will want to sell. That means someone has to buy, and buyers will have every incentive to drive hard bargains. Remember also, a great deal of this debt is in mutual funds with legally mandated daily liquidity. If more investors want their money than the fund has cash on hand, they must liquidate assets immediately at whatever price they can get. This is the sort of thing that can quickly snowball into a financial crisis. Something similar happened with commercial paper in 2008, but this has the potential to be even worse… and, if it happens, could come at a time when the Federal Reserve and Treasury can’t help much. I see serious risk of a corporate bond crisis in 2019, likely beginning in high-yield and leveraged loans but not stopping there. 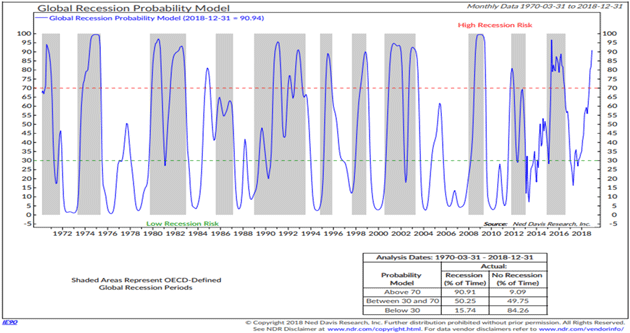 And since we are talking about recessions that have not yet been proclaimed, let me point out again this graph from Ned Davis Research which shows their probability of a global recession. Again, note that we are at levels that have always been associated with past recessions. Just saying, class, we should be paying attention. Meanwhile, we are about to witness new political challenges. With Democrats now controlling the House, there will be no more tax relief, but there will be a lot of other drama as they investigate and resist the Trump administration, which is their right. How the president will navigate this is not yet clear. I am not optimistic. The mostly likely outcome is (at least) two years of legislative gridlock. However, that may not stop Trump from using executive authority to continue his trade war, particularly against China. The Buenos Aires tariff truce ends March 2. Talks are underway but it will be hard to resolve the many tough issues by then. Especially with Lighthizer apparently still talking about higher tariffs. Really? Beijing simply can’t afford to give the US everything it wants without crashing China’s own economy. Maybe there is a compromise in there somewhere but right now color me worried and skeptical. Tariffs may go back up and further bite into US growth at a time when the economy already has other challenges. Furthermore, few are thinking about the NAFTA update that Congress must ratify. At a minimum, it certainly gives Nancy Pelosi a serious bargaining chip. Throw in the government shutdown? All of these: multiple central bank policies, the run-up in high-yield corporate debt, tariff and trade wars, political battles, government shutdown. They are all unforced errors, every one of them. The economy might be able to ignore them individually. Together? It is a witch’s brew for upsetting the applecart. But set Trump aside for a minute. Greater forces are at work. He’s president not because he created some new tribe, but because he recognized what was happening before others did. This next section needs a little set up. Bob Lefsetz is a music attorney by profession, but via his e-letter has become one of the foremost music industry critics and observers anywhere. I enjoy when he takes me down musical nostalgia lane (we are roughly the same age and generation), but I find his true value to me is when he talks about one of two things. First, when he offers seasoned advice to music industry newcomers as well as old pros. I have found many parallels between my own business and the music industry, so I learn a great deal. And over time, I’ve come to realize that these parallels exist in literally scores of businesses. Second, Bob is a committed California liberal. He writes about whatever is on his mind, and sometimes that is political. To his credit, he critiques both Democrats and Republicans. We all tend to live in our own echo chambers among people who agree with us. I find it useful to get outside mine. I learn a lot more that way, and it gives me a little perspective. Then again, the leaders of the sixties revolution were middle class, educated. Whereas today the middle class is shrinking, and everybody’s worried about economics, whether they can eat and have a roof over their head. You could have a minimum wage job and make it back then, now you can’t. We can no longer draw clear lines between economic, social, and political trends. There are no geographical lines. In a future letter I’m going to talk about the Fingers of Instability reaching into politics and income distribution, as well as economic fault lines. They all influence each other. One of my 2019 goals is to explore these relationships and what they mean to us all. Lefsetz ends his piece on a down note. I think change is a-comin’ and it will affect all of us in significant ways. Your investments, while important, are only part of it. We are losing the ability to work together against common problems. We can’t even agree on what is a problem. I keep trying to imagine what/who might reunite Americans, and drawing blanks. As Lefsetz says, we don’t have the kind of issues that would do it. Nor do we have any elder statesmen or nationally unifying figures whom everyone respects, much less agrees with. This will make our various problems worse. In short, I see dangerous times coming. I’d like to be wrong about this, but I don’t think I am. I think 2019 will be a Year of Living Dangerously, followed by the 2020s as a Decade of Living Dangerously. Then we’ll have a Great Reset and enter a new and better world. But we have to get there first. As you read this, Shane and I are likely back in Dallas. Sunday night and Monday morning, I’m briefly in Houston with business partner Steve Blumenthal and the whole team at SMH (more on them next week), then back to Dallas to meet Pat Cox and then we both fly to San Francisco for several biotech conferences, one on new antiaging and even age reversal (yes, really) technologies. Then we both fly to Baltimore for yet another presentation on a developing biotechnological miracle. Then I will somehow finish the next letter, get to Washington DC, meet old friends and fly back to Puerto Rico on Saturday. We will continue the “forecast issue” next week, dealing with Europe, China, and maybe a little bit more on the US. This letter is running long, so it’s time to hit the send button. You have a great week and a great new year and I look forward to being your partner in crime in the future. We are going to have a lot of fun getting through this together. A century ago, three men gathered in this house to remake the world, yet you’d never know it. The negotiations in Paris (only the signing was in Versailles) were a case study in primitive multilateralism. From January to June 1919, these three men redrew the world’s maps mostly by themselves. They largely ignored their own advisers, and almost entirely ignored the rest of the world. Primitive multilateralism diminished after 1945, but it’s making a comeback today. The victorious nations of the first world war were unprepared for peace, writes Margaret MacMillan in her authoritative history Peacemakers. But the Russian, Ottoman and Austro-Hungarian empires had dissolved, and Germany had been defeated, so suddenly there were borders to redraw. This was done with little input from the people concerned. Germany and newly Bolshevik Russia weren’t represented in Paris. China was barely heard, and the world’s colonies even less so: a young kitchen assistant at the Paris Ritz, Ho Chi Minh, never got a reply to his petition for Vietnamese independence. The Italians and Japanese were initially at the negotiating table but struggled to follow conversations in English and were soon sidelined. The Italians walked out over their obsessive demands for tiny Fiume (now Croatian Rijeka). Public opinion back home influenced the Big Three only over Germany: citizens and press demanded that “the Hun” be punished. But voters scarcely cared about lesser-known nations. The three leaders lacked focus, time and knowledge. Clemenceau was 77, diabetic and had been damaged by an assassin’s bullet in February, despite tut-tutting afterwards: “We have just won the most terrible war in history, yet here is a Frenchman who misses his target six times out of seven at point-blank range.” Wilson was in a hurry, uneasy about spending nearly six months in Paris, a record foreign stint for a US president. Lloyd George struggled with geography: he hadn’t known that New Zealand was east of Australia. Sometimes the three of them fought, especially over the Middle East: “You are the very baddest boy,” Clemenceau told Lloyd George. Eventually France got Syria, and Britain an Iraq concocted out of hostile ethnic groups, even though this contradicted Wilson’s principle of “self-determination”. The trio initially forgot Kurdistan altogether. Sometimes delegations of lesser countries were allowed into the mansion to present their cases. This rarely went well. John Maynard Keynes, representing the British treasury, witnessed Belgium’s presentation: Clemenceau slept, Wilson glanced at his newspaper and Lloyd George, entranced by one Belgian delegate’s falsetto, amused himself comparing it “to a number of other voices, human and animal, that he remembered”. Slapdash as the Paris peace conference was, it shouldn’t be blamed for causing the second world war, argues MacMillan. The conventional story is that a cruel treaty outraged the Germans and prompted Hitler’s revenge. True, the French started off demanding £44bn in reparations from Germany, but they later climbed down. MacMillan estimates that by 1932 Germany had paid £1.1bn (£72bn in today’s money). The bigger problem with the peace was its optics. The initial plan to negotiate with Germany was forgotten, as the Big Three spent months negotiating with each other. Finally, the Germans were simply told to sign the treaty, which included a dubious, provocative clause asserting German war guilt. Versailles was indeed a diktat to Germany, says historian Eckart Conze. If only the peacemakers hadn’t been in such a rush. They didn’t even reread the treaty before giving it to Germany. Almost instantly, Lloyd George and many other Britons and Americans regretted their harshness. “Much too stiff,” agonised Nicolson. But they failed to soften the document, partly because there were no permanent multilateral institutions where such things could be hashed out endlessly in full boring detail. The League of Nations — Wilson’s brainchild — was created in 1920 but never achieved much. Only after 1945 did strong multilateral bodies arise. Today they are losing influence. The world’s three most powerful men all have remarkable independence of action. Vladimir Putin and Xi Jinping each wield more personal power than any other Russian or Chinese leader in decades. Donald Trump, a bad listener, sounds like Keynes’s description of Wilson: “He allowed himself to be closeted, unsupported, unadvised, and alone, with men much sharper than himself, in situations of supreme difficulty.” Unchecked ageing leaders in a room together is a primitive system that we’ve tried before. With a global slowdown on the horizon, its tools for recovery are increasingly limited. Argentina ended 2018 in a recession, and it’s facing a challenging recovery. It has now gone through five technical recessions (defined as two consecutive quarters of contraction) in the past decade, and this one is shaping up to be one of the worst. Even with a substantial loan from the International Monetary Fund, recovery is a ways off; Argentina doesn’t have the same fiscal tools in place it had ahead of its worst recession in the past decade, in 2008-09. The government will need to lean on external markets to dig its way out. But just as Argentina is searching for alternative sources of investment and consumption, the global economy is approaching a downturn. Argentina may be forced to navigate this downturn with fewer tools than it had before. 2018 did not turn out the way Argentina thought it would. The government anticipated 2 percent growth in gross domestic product, inflation around 15 percent and an exchange rate of 20 pesos to the U.S. dollar. The IMF was similarly optimistic, estimating 2 percent growth and 22.7 percent inflation. But these numbers were way off. The government revised its expectations for the economy to 2.4 percent contraction; the IMF similarly anticipated a contraction of 2.8 percent. Accumulated inflation for 2018 reached 48.5 percent, according to Argentina’s central bank. The country’s currency fell from 18.6 pesos to the dollar at the start of the year to 38.4 by the end – despite the central bank, in the hopes of curbing interest rates and inflation, raising interest rates from 28 percent to a peak of 73 percent in October (though rates are now down to 60 percent). 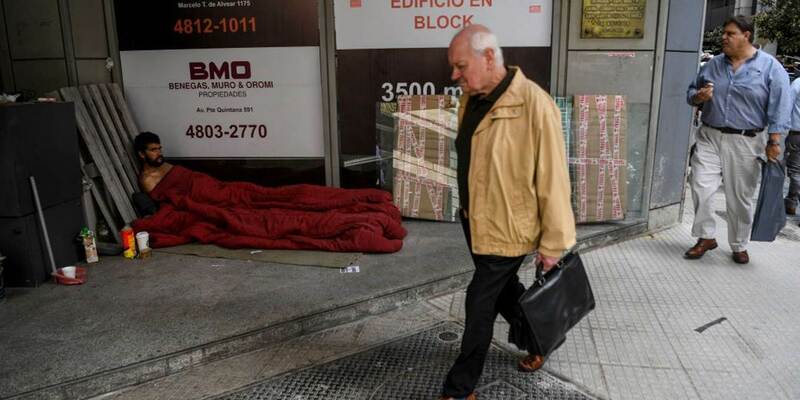 According to a study by Argentina’s Catholic University, urban poverty reached 33.6 percent in the third quarter of 2018, up more than 5 percent over the previous year. Unemployment hit 9 percent, up 0.7 percent from 2017. And public debt jumped from 59 percent of GDP in January to 78 percent at the close of the year. The current economic crisis has largely been a domestic affair, driven by the implementation of structural reforms, including subsidy cuts on consumer items, and a severe drought that wreaked havoc on soy crops. Years of high spending on state subsidies by populist governments grossly distorted the cost of basic goods, and the public became acclimated to artificially low prices. In 2018, the government took its most significant steps yet to correct these distortions, removing subsidies and allowing prices to rise toward market value. Over the past year, this led to average price increases of 24 percent for electricity, 70 percent for gas and 116 percent for public transportation. The drought-stricken soy crop produced 36 million tons, well below the anticipated 54 million tons and 37 percent less than the previous season. Argentina sustained an estimated $3.4 billion in economic losses in 2018, and the government was forced to reinstate a controversial export tax on grain, hoping to generate additional revenue in U.S. dollars, but it still saw an internal decline of 9.9 percent in tax collection in November. In 2008, Argentina was more financially isolated from the international system. It was coming off annual growth averaging 8.8 percent between 2003 and 2007, driven by domestic consumption and investment. Leading up to the current crisis, however, it has already endured three short technical recessions. After a lackluster recovery, consumers have less to spend, and their money is being spent on basic needs – which have just gotten more expensive. In addition, most wage increases did not keep up with inflation this year, further reducing consumers’ purchasing power. And businesses now find themselves with less money to invest. The end result: Argentina will need help from the outside world to jump-start growth through, for example, exports and foreign investment. But as the global economy slows, the likelihood that Argentina can attract foreign consumers and investors will dwindle. Any risk of Argentina’s crisis spilling over into other countries is still negligible, thanks to the IMF loan. But the rest of the world could have an impact on Argentina’s ability to recover from the current crisis: Just as Argentina tries to climb out of a recession, the rest of the world appears to be approaching the end of a growth cycle. This would make Buenos Aires’ response efforts all the more challenging, particularly when it comes to the structural reforms that will have long-term effects on the sustainability and strength of Argentina’s economy in years to come. Economists predict Argentina’s current crisis will be on par with 2009, which was its worst recession in the past decade. In 2009, however, Argentina’s economy was better prepared to deal with the fallout of a global economic downturn than it is now. Ten years ago, it had room to implement a strong fiscal stimulus package focused on social programs. In addition, many of the countercyclical social policies enacted in response to the 2001 crisis were still in place and could be quickly adapted to deal with the new downturn. But much of that stimulus has been tapped out, and this time around, Argentina was forced to take out an IMF loan – a resource it did not have in 2009 – as a last resort. The terms of the loan have constrained the government’s ability to spend its way out of this recession. The loan provides a necessary lifeline, but it’s predicated on the government reducing spending and bringing its deficit down to zero percent by the end of 2019. Half of the $56.3 billion loan has been paid to the Argentine government; the rest will be paid out in tranches through 2021. (Another $22.8 billion will be disbursed in 2019, and the remaining $5.6 billion in 2020-21.) What began as a precautionary loan has become an essential source of funding for the government’s budget. So, while Argentina has the IMF’s support this time, it comes with severe restrictions and aggravates the grievances of a population that remembers the IMF’s perceived shortcomings in response to the 2001 crisis. The duration of the current recession matters, too. Argentine President Mauricio Macri has said that the downturn has bottomed out and that he anticipates a quick recovery. His government expects the economy to contract by only 0.5 percent in 2019. The IMF is less optimistic. It believes the downturn won’t bottom out until the first quarter of 2019, when it expects the Argentine economy to contract by 1.7 percent. Private sector analysts project an even longer recession. A former central bank chief warned that Argentine consumers shouldn’t expect the recovery to begin until the third quarter of 2019, and financial consulting firm FyE Consult puts it even later, at the fourth quarter of 2019. The company also estimates the economy will contract a further 2 percent. 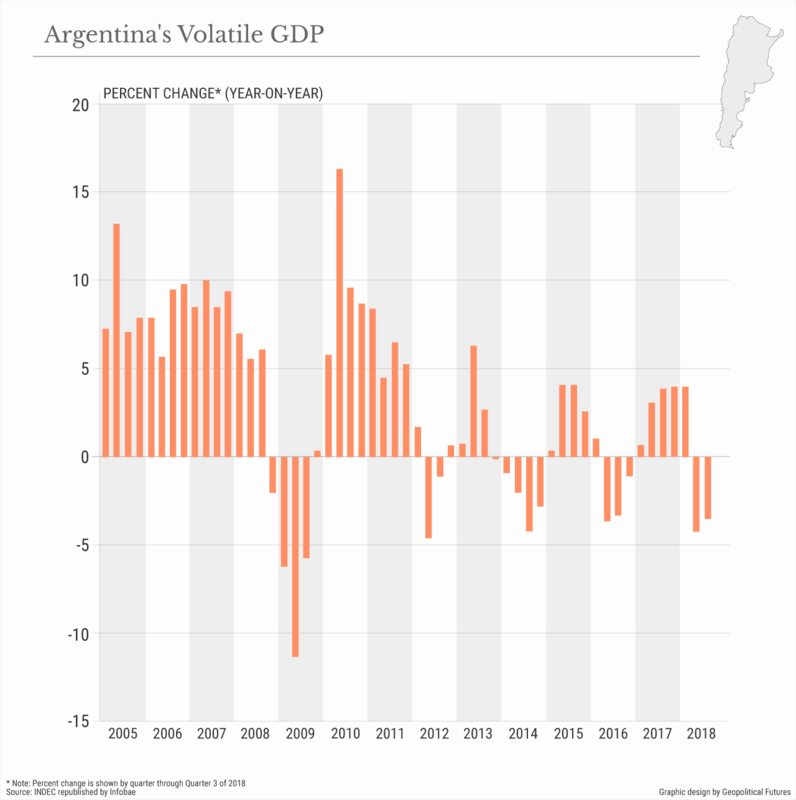 The chances of a strong economic recovery diminish the longer the recession lasts as Argentina becomes more likely to find itself in the midst of a global downturn. 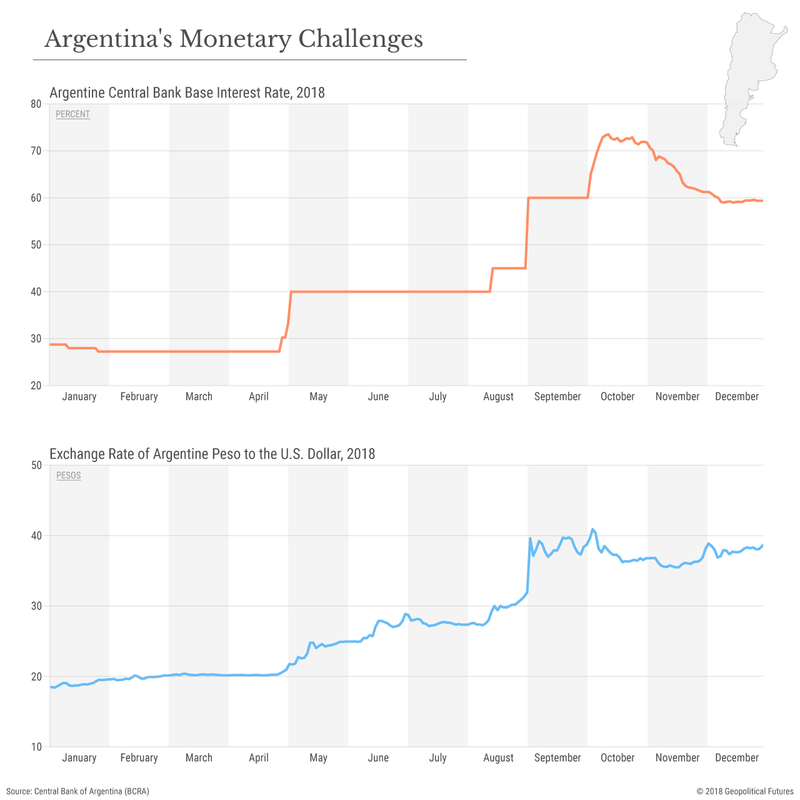 There’s more at stake than just Argentina’s ability to implement structural reforms and stick to the terms of the IMF deal, although both are critical to Argentina’s long-term economic stability. Argentina is trying to regain its economic standing in the world. While a member of the G-20, it now has only the 26th-largest economy in the world – overtaken by Switzerland, Taiwan, Sweden, Poland, Belgium and Thailand. Brazil is the regional economic power, and if Argentina fails to pull off a strong recovery, it will lose any remaining ability to check its rival. Without the resilience Argentina had in 2008, it’s not as well prepared for the coming global slowdown. The time before it hits will be critical for Argentina; once the global slowdown takes hold, it won’t have the needed external resources available to help it overcome its domestic constraints – and recovery will be even more difficult to achieve. January 1 marks the 20th anniversary of the euro’s launch as an electronic currency. It is good that Europe’s leaders are passing this milestone in a more guarded, less self-congratulatory spirit than was the case in the build-up to the 10th anniversary. In 2008 the European Commission published a report that described the euro as “a potent symbol of our growing political unity” and “a pole of stability for the global economy”. The report was barely off the printing presses before the western world’s financial system was in meltdown. Europe found itself in a sovereign debt and banking sector emergency that lacerated its political unity and raised doubts about the survival of the currency union. Having come through this test of fire, national governments and policymakers at the European Central Bank, commission and other EU institutions are thankfully alert to the dangers of complacency. For sure, the risk that the eurozone will break up has shrunk since the crisis years of 2010-12. Even the chance that Greece, the area’s weakest member, will drop out has diminished since 2015. Yet these possibilities have not entirely vanished. The reason is that the architecture and policymaking processes of the eurozone remain a work in progress. These shortcomings apply to European banking union, the eurozone’s fiscal rule framework and the crisis-fighting instruments available in the event of an acute debt emergency in a large state such as Italy. Banking union has made considerable strides with the creation of a single supervisory mechanism, a single resolution authority and regulatory reforms aimed at making Europe’s banks more resilient. However, the slow progress on establishing a common deposit insurance scheme means that Europe’s banking union remains incomplete, leaving the eurozone vulnerable if another sovereign debt and bank crisis were to break out. Strengthening the banking union should be among the eurozone’s highest priorities for 2019. As far as concerns the eurozone’s fiscal rules, the essential problem is that they are arcane, illogical and a source of frequent friction both among governments and between Brussels and national policymakers. The rules suffer from their emphasis on trying to use a yardstick, a government’s structural budget balance, that is impossible to calculate accurately. Beyond this, the EU authorities appear to lack the conviction and strength to enforce the rules consistently against recalcitrant governments. This has the pernicious effect of discrediting the rules without deterring some politicians from ignoring their duties to the currency union as a whole. The eurozone needs a more transparent set of rules that encourage governments to reduce public debts and budget deficits, but offer more leeway to countercyclical national fiscal policies when appropriate. The question of how the eurozone would deal with another full-blown crisis has not yet received a proper answer. The Single Resolution Fund, the eurozone’s bank rescue scheme, is to be allowed access to funds from the European Stability Mechanism, the vehicle for assisting governments. But disagreements persist about whether the eurozone should impose losses on investors by insisting on restructuring the sovereign debt of governments applying for aid in a crisis. Challenging times lie ahead for the eurozone as economic growth slows, notably in countries such as Italy where debt levels are already too high. It is essential that policymakers should equip the eurozone to fight the next crisis better than they did before 2008. With the right approach, Latin America, which has recorded just 0.5% average annual GDP growth during the last five years, could improve its economic prospects considerably, potentially avoiding another lost half-decade. The question is whether it will muster the political will to take the necessary steps. Then there is Argentina, which this year faced a currency crisis, a run on the peso, and double-digit inflation, and had to secure an International Monetary Fund bailout totaling more than $57 billion – the largest the IMF has ever disbursed – to help it shore up its finances. In the last five years, Brazil also underwent its deepest-ever recession, from which it is emerging very slowly. Mexico, for its part, has maintained a mediocre growth record for decades. Even the relatively strong performers of the past, such as Chile and Colombia, have struggled with slow economic growth over the last five years. Peru, which stood out among the world’s large and medium-size economies for its robust performance in the early twenty-first century, has not been able to recapture strong growth. The good news is that Latin America’s economic prospects seem to be improving, though the recovery will be slow. The UN Economic Commission for Latin America and the Caribbean has recently projected an average growth rate of 1.7% for 2019, half a percentage point less that what the IMF had projected just two months ago. Although Brazil’s recovery is expected to continue, growth will be constrained by the need to address fiscal imbalances, whereas Mexican growth will remain slow. In both countries, major political changes accompanying the election of new presidents are generating uncertainty. The large and medium-size economies that will fare the best are Peru, Colombia, and Chile – possibly in that order – though their growth rates will remain much lower than during the commodity boom of 2004-2013. The worst performers will be Argentina, where the recession will continue, and Venezuela, which shows no signs of escaping its plight anytime soon. The weakness of Latin America’s recovery is partly a result of an unsupportive international environment. Growth is slowing in the major developed countries, as well as in China. Protectionism is on the rise, with the United States and China engaged in an escalating trade war, the consequences of which will be transmitted to Latin American primarily by means of trade diversion. Moreover, commodity prices, which began recovering in 2016 from their collapse in previous years, have been falling again in recent months. Oil prices, which increased the most sharply, peaked in October and have plummeted since. Finally, portfolio capital flows have slowed, while their costs have increased, owing to rising US interest rates – a trend that is likely to continue – and increasing risk spreads. Fortunately, as I have previously argued, there are no signs of a “sudden stop” in external financing, which led to catastrophe during the debt crisis of the 1980s and after the 1997 Asian financial crisis. The solution to Latin American countries’ economic travails lies in deep reforms, though not necessarily market reforms, which have a relatively poor record in generating rapid growth in recent decades. In 1950-1980, when Latin America experienced rapid industrialization, its average growth rate was 5.5% per year. Yet, since 1990 – after the debt crisis of the 1980s – the region has managed just 2.8% annual growth. The rapid and premature deindustrialization that Latin America has experienced since the 1980s is a key reason for this. Indeed, the most significant long-term slowdown has occurred in Brazil and Mexico, the region’s two largest economies and the main success stories of industrialization. Given this, Latin America should pursue reforms that support industrial manufacturing, even as it continues to exploit its strong comparative advantage in natural resources – an advantage that has facilitated increasingly close ties with China. Such reforms should include increased infrastructure investment, which, according to the Development Bank of Latin America, currently amounts to about half of what the region needs. At a time of rapid technological change, Latin America also needs to invest much more in research and development. UNESCO reports that the region currently spends only about 0.7% of GDP on R&D, compared to 2.1% in East Asia and 2.4% in high-income (OECD) countries. Finally, Latin America must consolidate its regional integration processes. To be sure, there have been some successes, especially the Pacific Alliance (with Chile, Colombia, Mexico, and Peru as full members). Central American integration has also made steady progress. But the two biggest South American integration projects – Mercosur and the Andean Community – have lately failed to bridge the political divisions among their members. With the right approach, Latin America could improve its economic prospects considerably, potentially avoiding another lost half-decade. The question is whether it will muster the political will to take the necessary steps. José Antonio Ocampo is a board member of Banco de la República, Colombia's central bank, professor at Columbia University, and Chair of the UN Economic and Social Council’s Committee for Development Policy. He was Minister of Finance of Colombia and United Nations Under-Secretary-General for Economic and Social Affairs. He is the co-author (with Luis Bértola) of The Economic Development of Latin America since Independence.